On a typical work day for Clay Goodman — if there is such a thing — he might rub elbows with Dallas Cowboys owner Jerry Jones. He may hang out in the commons area at The Star, the NFL team's practice facility, and greet players and coaches passing through on their way to and from the field. "The novelty doesn't really wear off," the Crook County High School graduate admits. "It's a pretty awesome experience." Goodman finished high school in 2003 and wasted little time joining the Prineville Hotshots. Having grown up with a father who was a hobby pilot and owned his own super cub plane, Goodman developed an itch for flying early in life. His final year of high school he learned to fly for his senior project and had soloed prior to graduation. The Hotshots gig kept Goodman busy during his summers while he attended Oregon State University. Three years into college, he was accepted into pro school for construction engineering management. His career path was set. But flying continued to tug at Goodman, and during his summers with the Hotshots, he developed a growing interest in helicopters. "It turned out that I did a lot of hands-on work with helicopters," he said, "doing spot drops and calling helicopters in, so it intrigued me to learn more about them." 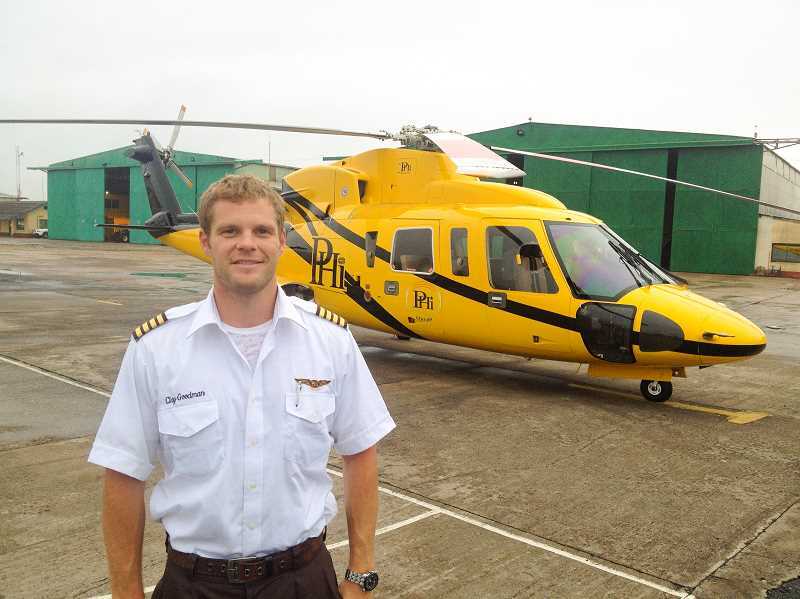 So when the chance to fly for a living dropped into his lap, Goodman opted out of his chosen construction engineering management training and joined forces with a friend who had launched a helicopter school in Redmond. "I was like, alright, why not?" he recalls. "I'll take a year off, jump in and see what this is all about it." Goodman trained in Redmond where he "caught on real quick." The upstart school didn't last, but he met a guy who owned a helicopter school in Montana, where he could finish his training. "So I packed up my stuff and went to Missoula," he said. Earning "every rating you can get," Goodman began instructing aspiring helicopter pilots and giving tours around the Mission Mountains. That gig lasted from 2008 to 2011 when he landed another job even further away from home. "I got a job working in the Gulf of Mexico, flying to oil platforms with a company called RLC," he said. "There are tens of thousands of oil platforms there – anywhere from one mile off the beach to 150 miles off the beach." Goodman said he would get up at sunrise and head out with whichever guy he was transporting that day and take them to every platform they needed to service that day. "It was quite an experience to take off flying away from the beach out into the water and lose sight of the land," he said. "It's a pretty bizarre feeling." One year flying in the Gulf opened up another opportunity to further broaden his horizons, figuratively and literally. Goodman's training captain with RLC took him to an interview one day with PHI — a company he would continue to work for through present day. Next thing he knew, Goodman found himself leaving behind the familiar landscapes and cultures of the U.S. and working frequently in other countries throughout the entire world. "It is kind of a funny story how I got the job working international," he said. "I went in for an interview, and during my interview, a guy in Ghana, Africa, wrecked his bicycle. They needed a guy (to fly there) like right now, so they asked me if I would be willing to go." I'm young and I'm single, Goodman thought as he took inventory of his responsibilities and decided "heck yeah, why not?" Next thing he knew, he was headed over the Atlantic to Takoradi, Ghana. The impromptu trip later morphed into his first of many month-long contracts. While working in Takoradi, Goodman transports oil rig crews in and out from the Africa mainland. "The cool thing about all of that month-on, month-off schedule is I had the opportunity (during my month off) to travel the world," he said. "I have been everywhere. Instead of coming back to the States, I would go to different countries and just spend a month in Thailand or Australia. It was an amazing experience." Some of his personal favorite destinations include Sydney, Australia, and Bangkok, Thailand, as well as Athens, Greece, and Peru. The best part, he said, is seeing how unique the cultures can be from one side of the world to the other. "Once you start going to exotic places, the culture and the views are unlike anything else in the world," he gushed. "It's amazing." After fulfilling contract jobs for about a year, Goodman took another job in 2013 as an air medical pilot in Saudi Arabia — another country that makes his short list of most interesting places. That job concluded in 2016 and the following year, Goodman returned to the U.S., living in a home he had restored in Austin, Texas. There he spent time getting settled before selling the house and moving north to Dallas, where his next pilot gig unknowingly awaited him. "Just to show you how small of a world aviation is, I was at a Cowboys game, and my area manager in Takoradi called me. He was flying here (in Dallas) for the Cowboys," Goodman remembers. "They needed an extra guy, so he said come next week, and I'll get you a job here." Thus began a contract job through PHI for the Dallas Cowboys that he has held ever since. Now, instead of flying all over the world, or completing air medical missions where human lives are at stake, Goodman is flying Jerry Jones, one of the most widely known NFL owners, to wherever he and his family and other companions need to go. "I am not a die-hard football fan, but in middle school I had a Cowboys Starter jacket. I have always loved the Cowboys," he said. "My initial meeting with Jerry, I was kind of star-struck — that doesn't happen to me very often." Goodman has since enjoyed many a flight with the Jones family in what he characterizes as an intimate setting. "It's not like we are just somebody in the background taking pictures. They are sitting right with us and spending time with us," he said. "After a while, you get to know them. It's a pretty cool thing." At age 33, Goodman is still young and still single, and for now he intends to hang onto the Cowboys gig as long as he can. And while piloting helicopters is his primary passion, he has begun work to earn ratings to fly jets, hopefully for Jones. Also, he has recently accepted a job as an air medical pilot in the Dallas area, and once that work begins, he will split time between that job and his work for the Cowboys. Looking back, Goodman says he "went with his heart" when he took a blind leap into the aviation industry, and he has been happy with the results. "I just went with it, and I believe everybody should do that if the opportunity presents itself," he said. "Take a chance and do something that you love."